Daredevil (alter ego Matthew Murdock) is a fictional superhero in the Marvel Comics universe. 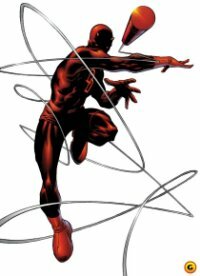 Created by writer Stan Lee and artist Bill Everett1 in Daredevil #1 (April 1964), he is notable as being among the few disabled superheroes. In February 2003, 20th Century Fox released Daredevil, a feature film starring Ben Affleck, Jennifer Garner, Colin Farrell and Michael Clarke Duncan, and directed by Mark Steven Johnson. While opening strongly and eventually surpassing $100 million in ticket sales, poor word-of-mouth and negative reviews curtailed its momentum. A director's cut DVD was released in November 2004 with nearly 30 minutes of additional footage. Garner reprised her Daredevil movie role in the solo sequel Elektra (2005), co-starring Goran Visnjic and directed by Rob Bowman.